While channeling classic releases by Vangelis and Jonn Serrie, Palancar has some fresh things to say. On Elysium Planitia (60'17") he (a.k.a. Darrell Wade Burgan) makes an enchanting first impression. At once subtle and commanding his work is beautifully simple and straightforward. Lyrical synth melodies sway above sustaining string pads while elsewhere gentle electro-rhythms softly pump beneath vaporous echo trails and a harmony of digital "oohs" and "aahs". The energy shifts and drifts between majestic synthesizer swells and deep rumbling sub-sonic quakes. We listeners hover blissfully in space one moment only to swoop down for an alien fly-by the next. This work is exceptional in its dark hued subtlety as well as its poignant space themes - the grandeur and mystery of the cosmos are both well represented. 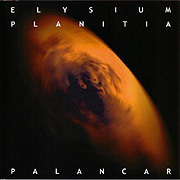 Although Elysium Planitia is an aural homage to the planet Mars, this album is better a pipeline into the artist's inner world. Every track highlights a remarkable facet, without any heaviness weighing the music down.